Today I want to bring you a plug-in for Lightroom that I have found very useful.. especially if I want to add extra information to the Metadata of a photograph. The plug-in is called Big Note and can be downloaded here. You can use it for all different things… I use it to keep track of which images I have posted on FineArtAmerica. And you can do this by creating a Smart Collection and using the term of the Big Note to filter your Smart Collection. The plug-in is unencrypted and with a little coding experience you can amend the plug-in, by adding new fields etc. I customised my use of the plug-in to use basic terms like Notes and Extra Notes. 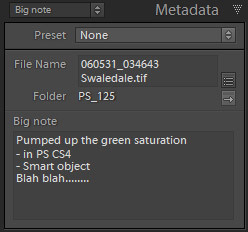 This plug-in is invaluable because you can put as many notes as possible into the field and then use a Smart Collection to find images with a particular phrase for that note. Anyway weekend is not far away and I wish you all a good weekend. Until next time… happy snapping.